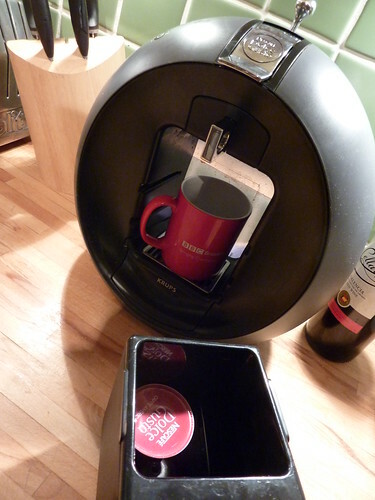 In between intense bursts of gift-wrapping today, I’ve made myself a coffee in my groovy coffee making device. Despite being seriously environmentally unsound – each drink uses a ‘pod’, the container in the foreground has a collection of used ones – I couldn’t do without it. It makes fantastic coffee. It looks the part too. The water tank at the bank lights up in blue light. It looks all Star Trek. It makes visitors ask ‘what on earth does that do?’ whenever they set foot in our kitchen for the first time. It was a Christmas present last year after a friend of mine had introduced us to the drinks hers served when we visited her in Siegberg last year for the Christmas markets. What’s unusual is that as Christmas presents go, this has been one which has seen the most use since it was purchased. And whenever I use it, I nearly always think of my friend in Siegburg. Normally gifts have a ‘shelf life’. The ones I find unused and unloved in the attic are the ones are horrible things to find. But those which remain in the eyeline for the entire year remind us of something well-chosen. A warm reminder of someone who clearly understands what makes you tick. What’s your long-lasting Christmas gift from last year? What’s its story? Husband & I have radically different sleep needs. He needs total darkness & silence whilst I fall asleep most happily with light & low, companionable noise. I don’t get to have the light, but the number of BBC podcasts & Listen Agains I’ve heard the first 10 mins of over the last year, is phenomenal, and all without disturbing the sleeping beauty who bought it for me. Damn. I should have got one of those! I did momentarily consider buying one of those blankets with sleeves for slobbing out on the sofa in – a Slanket? – but figured that it may be only partially opened by the recipient before being taken back to the store or to a charity shop. My mother the genius inventor has made me several presents that have seen a good deal of use. One is a pair of socks with wheat pouches sewn in, which can be microwaved for toasty warm toesies. Another is an ingenious bottom-sheet/underblanket arrangement whose mystical configuration I can’t even describe, but it is soft and fluffy and warm (and, unfortunately, a magnet for every cat in the neighbourhood). One might conclude that even socks can be special and appreciated if they’re sufficiently gadgetlike!